We've been enjoying some warm spring weather in Texas! Spring is definitely here. I hope you had a lovely Easter weekend. Mine was very busy! The day I hurt my hand last week I had taken my sewing machine in for it's complimentary one year tune-up and I still don't have it back. There hasn't been much sewing going on around here without it. My finger is still unbelievably sore. What I originally thought was a large cut turned out to be a cut and a very deep puncture. Good thing I had that tetanus booster last year when I had the rotary cutter accident. A few weeks ago I participated in my first big swap on flickr where I traded some American Jane Peas & Carrots (aka Mono Pez) for Flea Market Fancy. The swaps are still trickling in and I'm just giddy when I check the mail! I'm still missing about six prints that happen to be the hardest to find, but I'll keep looking. I want to make a quilt with all of this Flea Markety goodness, but I haven't decided on a pattern yet. I just love this one and this one! Oh, and this one! I'm going on a Texas history field trip for the remainder of the week with my daughter's fourth grade class. We are visiting the Texas capitol and the Alamo among other historic Texas sites. I'm mostly excited about the hours and hours of travel time I'll have to work on my ripple afghan. I've been trying to sew hexagons together, but it's quite slow without my index finger. I've adjusted my crochet hold to work without my index finger, so crochet is still an option. I'm hoping to get another hexagon thoughts post together for this week but I need to get my packing done first. It's so great to see all the beautiful hexagons everyone is working on! Enjoy your week! Oh my, look at all that yummy FMF!! I think I may be jealous, haahaa. I can't wait to see what you decide to make with it all. I hope your poor finger feels better soon, I know how frustrating it is to be limited!! What a beautiful box of fabric. Enjoy your mail! Hope you are feeling better soon. Boy, your finger is taking a while to heal. Hopefully you will be back to normal soon. Aren't swaps so much fun. 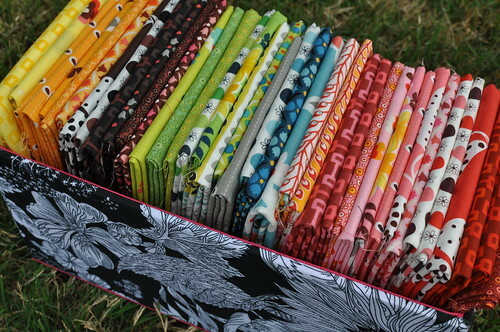 I think you will be making one lovely quilt from these fabrics! Have a great time on your Texas history week. That sounds like a lot of fun! What a pretty box of fabric! Can you tell me how you found about about the swap on flickr?